N E W saucePro – probably the most innovative pizza product in the last decade! …the fast, uniform application of the exact amount of sauce. 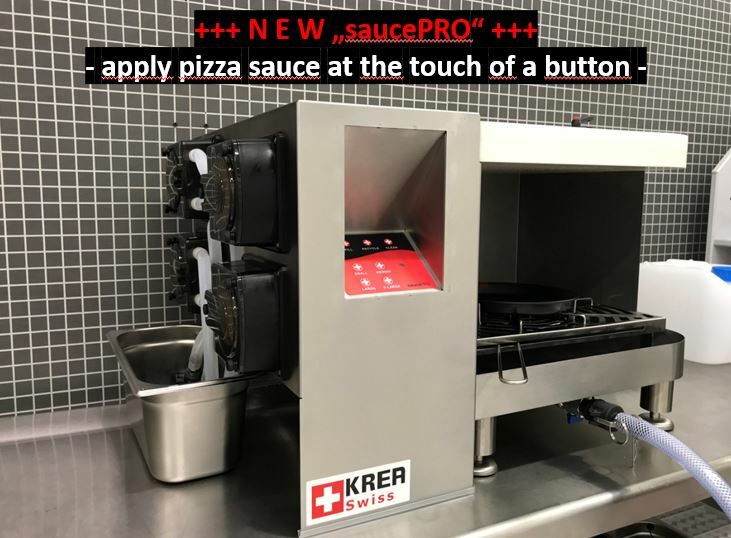 After years of hearing how tough it is to train staff to efficiently apply a consistent quantity of sauce to the pizza, KREA Swiss decided to develop a simple to use, automatic, table-top device at a price that offers payback in weeks. By simply pressing a button, saucePRO (click to see video) delivers the exact amount of sauce for that pie size, in under 2 seconds. In addition to reducing labor costs by an estimated 10-15 seconds for a quality finished pizza, it also increases output during peak periods. saucePRO standardizes your recipe & quality – especially important with less experienced employees. saucePRO works with pure mashed tomato’s or diluted pastes and can handle seeds, shredded skin & seasoning. A hidden “customization” knob allow the business owner to easily set up the unit for their sauce viscosity and volume. The sauce finish is intentionally designed to still look “unique”, but it eliminates quality issues caused by ladles, such as “sauce ridges” or dough “blow outs”. Each standard saucePRO version works with 10, 12, 14 and 16-inch pies. Other custom versions are available including an additional 18-inch round pie, a single pie version or even different sized square pizzas. ts small table top footprint and user-friendly design have space and simplicity in mind – in fact, it takes up just a little more room than is required to ladle-finish an 18-inch pie from a 5-gallon sauce container. The internal self-flushing program, stainless-steel surfaces and dishwasher friendly components, make cleaning nice and simple. Additional buttons for “Fill up” and “Recycle” programs further simplify the operation. Unlike large industrial single size pizza saucing systems, saucePRO does not need compressed air – it uses your normal power supply. It is produced from industry standard FDA approved materials and the unit is maintenance free. saucePRO eliminates the messy, slow and inconsistent manual saucing approach and replaces it with a fast, uniform and exact process! 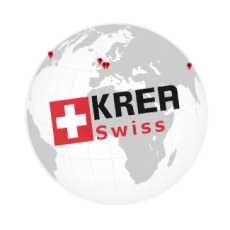 KREA Swiss AG has long been known for delivering high quality innovative, time saving sprayers in the bakery & chocolate industries. According to Mr Al Roma, President of specialist pizza equipment distributor NMI, “These products coming out of Switzerland are great – they make it easier and faster for professionals to deliver quality fast and keep to a recipe. saucePRO is going to be a big hit”.